Sheffield United moved to within two points of the Championship’s automatic promotion places with victory over 10-man Middlesbrough at Bramall Lane. 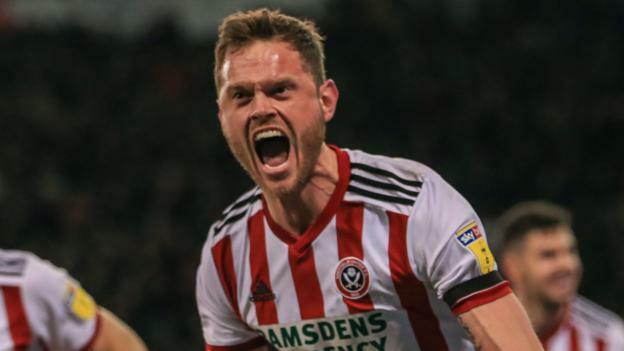 Richard Stearman headed in Oliver Norwood’s curling free-kick to give the Blades the lead a minute after top scorer Billy Sharp had a goal disallowed for offside. Boro’s night got worse four minutes later when centre-back Daniel Ayala was sent off for two yellow cards in the space of seven minutes. Substitute Britt Assombalonga had the best chance to bring Boro level, but Dean Henderson saved with his legs after the striker was through on goal. The win sees the third-placed Blades go behind second-placed Norwich, who lost 3-1 at Preston to slip from the summit of the second tier after Leeds beat Swansea City. Both goalkeepers provided the highlights of an uneventful first half – Boro’s Darren Randolph making a fantastic one-handed save from Mark Duffy’s excellent shot after six minutes before Henderson tipped Jordan Hugill’s effort past the post. The visitors almost took the lead five minutes after the restart when George Friend’s goal-bound header was cleared off the line by Enda Stevens. Gary Madine had two shouts for a penalty waved away shortly before Stearman’s goal as Boro missed the chance to go above fifth-placed Bristol City.